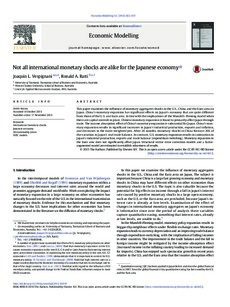 This paper examines the influence of monetary aggregates shocks in the U.S., China and the Euro area on Japan. China's monetary expansion has significant effects on Japan's economy that are quite different from those of the U.S. and Euro area. In line with the implications of the Mundell–Fleming model when there are capital controls in place, Chinese monetary expansion is found to primarily affect Japan through trade. The income absorption effect of China's monetary expansion is substantial for Japan. China's monetary expansion results in significant increases in Japan's industrial production, exports and inflation, and decreases in the trade-weighted yen. After 24 months, monetary shocks in China forecast 20% of the variation in Japan's real trade balance. In contrast, U.S. monetary expansion results in contraction in Japan's industrial production, exports and trade balance (expenditure-switching). Monetary expansion in the Euro area does not significantly affect Japan. Structural vector error correction models and a factoraugmented model are estimated to establish robustness of results.